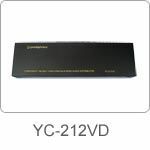 YC-212VD is a 2 x 12 AV HDTV distribution amplifier which allows any A/V source with component video, digital audio, stereo audio and composite video to distribute A/V to 8 different locations without any signals loss. The port of digital audio not only supports standard SPDIF audio but also can be used to switch standard video. 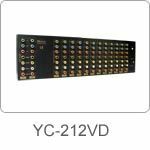 YC-212VD is ideal for the home audio/video, transportation, theater and commercial AV applications which need multiple displays. When more than eight outputs are required, multiple YC-212VD can be linked to large number of TVs with equal picture quality, which helps you save the expense of additional A/V receiver. YC-212VD also has the 19 inch rack mountable accessories kit for the 19 inch cabinet. • Video : bandwidth300MHz and support Component Video YPbPr(YCbCr) / RGBHV. • Coaxial: support Digital Audio、SPDIF、PCM, Composite Video 110MHz. • Audio : Stereo Audio ( AR-HD/AL-VD). • Scan rates: 50Hz or 60Hz available and support 480I、720P、1080I、1080P resolutions. Net Weight(Unit Only) 3Kg Approx.